The style-focused items that will make laundry seem like less of a chore. If we had to rank our favorite rooms, the laundry room would probably be on the tail end of said list. The fact that its sole purpose is centered around a chore doesn’t help. But just because it’s meant for menial tasks like folding, drying and stain removal, doesn’t mean it should become a catch-all for miscellaneous cleaners, linens, and whatever else may not have a designated zone in your home. Instead of thinking of your laundry room as a mundane space to do your chores, think of it as multipurpose space—and with a few organizational products, you can make the most it. Conquering the clutter is just one way to give you some peace of mind— that is, while you wait until that next load is done. Ahead, a few of our go-to organizational essentials from The Container Store! Versatile for its ability to be used as an A-frame rack or as a storage ladder that can be set against a wall, this sturdy option is both small-space and environmentally-friendly. It’s also super lightweight, so it makes set-up and take-down a breeze. Finally, a style-focused approach to concealing dirty laundry. 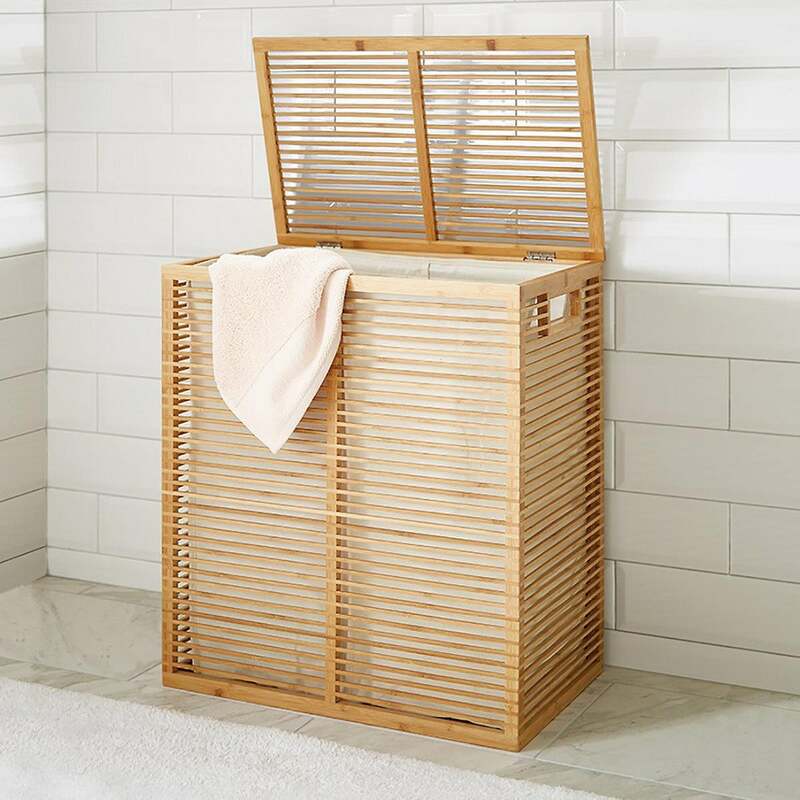 We love the look of this bamboo hamper, especially the fact that it can fit in with just about any decor scheme. If you are lucky to have a few cabinets in the laundry room, how guilty are you of keeping the detergent and one box of dryer sheets at the very front and letting whatever other miscellaneous cleaning supplies scatter at the back? These mesh, glide-out drawers are durable enough to hold heavy containers of detergent, plus whatever other essentials you may need. Hang this multi-purpose organizer over the door—closet or entry, that’s up to you—for easy, added storage space. A handy bracket is built in to hold up an ironing board, while the basket above can accommodate a handful of other essentials. Baskets that are stylish and functional? We’re all for it. Utilize these chic copper wire baskets to store everything from extra linens and towels to paper towel rolls and more. This ultra innovative design folds down to mere inches when not in use, so it’s perfect for small-space dwellers who don’t have the luxury of space when it comes to air-drying clothing. You can mount it pretty much anywhere, and pull out to drape t-shirts, lingerie, light sweaters, or hand towels. Layer these handy gadgets on ordinary hangers to hang multiple items in one space. Alternatively, you may use them to hang various other household essentials such as dust pans, dusters, or totes. This storage option is great for its slim design, which allows it to easily fit in between a washer and dryer. Plus, it’s great for keeping all your essentials within hands reach. Not every laundry room is lucky enough to have cabinets or designated storage. This clear plastic bin makes it easy to keep all your soaps, detergents, and stain treatments in one place.